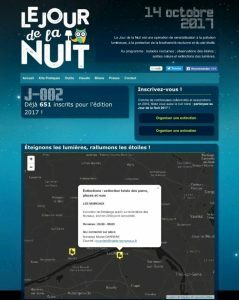 The City of Les Mureaux participated on October 14th in the demonstration “Le jour de la nuit”; Le Jour de la Nuit is an operation to raise awareness of light pollution, the protection of nocturnal biodiversity and the starry sky. The city of Les Mureaux has therefore chosen to turn off its public lighting during the night from Saturday to Sunday. How can this major operation be carried out in a few clicks? Thanks to the Citylone equipment installed in each lighting mast: a controller that controls the lamp and can be programmed remotely to switch off at a specific time as during this event. A successful operation that shows the commitment of the Offices to the protection of our environment.